We camped at an area called Fall Creek near Lowell, OR. 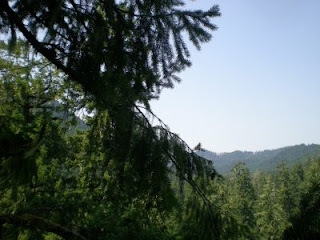 It is about a 6 hour drive from Seattle and a lovely part of the Willamette National Forest. We had a campsite next to a babbling little creek and on Sunday night, we had the campground to ourselves. The next day bright and early, we met with the guys from the Pacific Tree Climbing Institute so that Ryan could begin his climb. I was originally going to go in search of internet access or look for some local letterboxes. 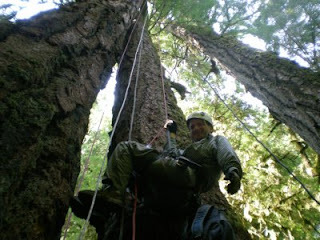 But the Tree Climbing guys convinced me to come along and I ended up suiting up in harness and ropes and climbing up the 250 ft. Douglas Fir right behind Ryan! 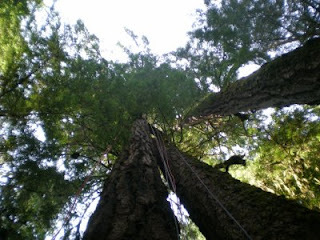 We hiked a few feet into the forest to a group of three trees that the climbers have nicknamed "The Three Musketeers". We would be climbing Aramis. Another lady joined us and there were two guides to help us up the tree. 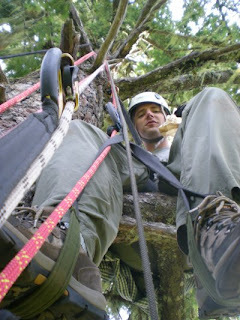 We were outfitted with climbing harnesses, gloves and helmets. Then it was a matter of inching our way up the tree. It took us about 2 1/2 hours to climb up to about 200-210 feet. I was certainly the slow one. Ryan was a natural. 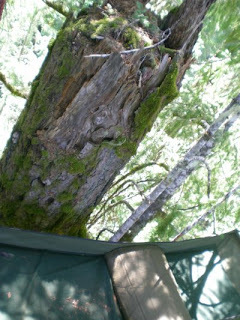 At about the 100 ft. mark, they have hammocks or "boats" secured in the branches of the tree for when they have people spending the night! It is at this point that you can see that the Porthos tree has lost it's top. We had a lunch at the top of sandwiches, apples and cookies. The views were terrific. The ropes we are climbing on are secured at the top of the tree. We asked how they get the ropes up there and found out that when they first climb a tree, they shoot the ropes up with a bow and arrow. They will climb up, checking along the way to make sure that the tree is sound and not diseased or rotted in any way. It was a breezy day when we were climbing, which was nice because it kept away the bugs. But at the top, you could feel the tree sway with the wind. 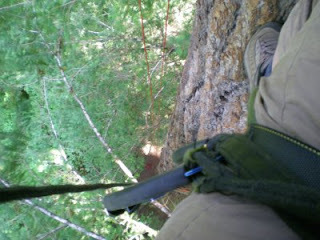 Then it was a simple thing to rappel down to the bottom again. From Lowell, OR we went into Eugene to spend the night. 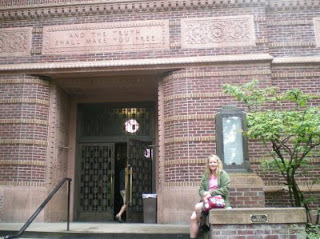 I had plans for Tuesday to visit the University of Oregon at Eugene. In their library, they have some boxes of papers from the Stratemeyer Syndicate. Edward Stratemeyer was the creator of Nancy Drew and the Hardy Boys and countless other children's book series. In the papers, they have a manuscript of a Nancy Drew book and fan letters written to the Syndicate authors from 1928 and 1929. Fascinating stuff. While in Eugene, we met up with a bunch of local letterboxers and had a wonderful night of Pizza and Margaritas! On Tuesday, after spending time in the University Library, we drove out towards Sisters, OR. There, we met with some letterboxing friends at a campground on Suttle Lake. We spent two nights there on the lake, camping, hiking, letterboxing and telling stories around the campfire. All in all, I was very pleased with the performance of the Behemoth. As a reminder, for those of you who have not already, you can pledge to my Washington Trails Association Hike-a-thon directly on their website this year. WTA Hike-a-thon I am already almost halfway towards my goal of $1,000 and August has not even started yet! That is very encouraging. I have gotten a lot of small pledges from flight attendants who did not pledge in previous years, so that is great -- Thank You! And Doublesaj and Old Blue have put out a challenge to letterboxers: They'll increase their pledge by $10 for each letterboxer (up to 4) who pledges $25 or more who've never made a pledge before. So far, no one has taken them up on that challenge. 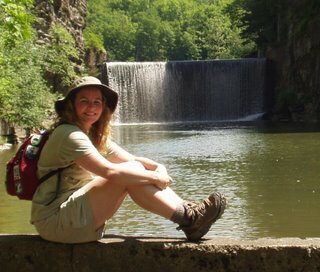 It's that time of year again and I am getting excited about the WTA Hike-a-thon 2008. This year the group at WTA has created an individual webpage for me to keep track of my pledges which is really terrific. It lets you guys donate your money directly to WTA with your credit card. Of course, I will still have the blog for updates on my hiking mileage etc. And you can still send pledges to me, I will be collecting cash and checks to turn in at the end of August. My sister is going to come to visit Seattle and we have a camping trip planned to the Olympic Peninsula, always one of my favorite places to hike. I also want to challenge myself to use more public transportation to get to hiking trails this year! I know I said last year that carless hiking was not for me, but with the price of gas in Seattle creeping towards the $5 a gallon mark, I think I might need to rethink that attitude. And it is certainly possible to take the city bus to hiking areas around urban Seattle. That will be a bit of a challenge and should add some local color to my adventures this year. 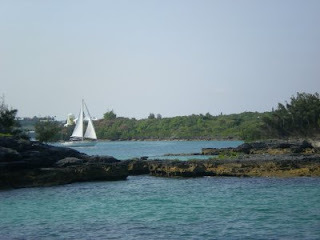 Ryan and I just got back from a Letterboxing Cruise to Bermuda. We had a terrific time. We started out from Seattle flying to New York City via Phoenix. Since we travel standby on USAirways, we were not quite sure when we would arrive in New York. Nor were we sure WHERE we would arrive. We had lots of options. Laguardia Airport, Newark, NJ or JFK would all put us close enough to the cruise ship terminal. We just wanted to go on the airplane that had some seats. We got to Phoenix and the airport was packed with people. Many of the flights are oversold and we watched paying passengers get bumped when they did not arrive at the gate in time. A word to the wise, don't loiter in the airport bar, you are better off hanging around your gate area. The best part about spending time sitting around the Phoenix airport is free wifi! Finally we got on a plane to JFK. The last time I was at JFK, we were parked right next to the British Airways Concorde. So it was a few years ago. Bright and early on the morning of the cruise, we took a Super Shuttle van from JFK to the Cruise Ship Terminal in Manhattan. It cost about $30 for the two of us. Super Shuttle is a shared van service, so we were in a full van with people who were going to hotels in Manhattan. We basically got a tour of downtown NYC. The van criss-crossed back and forth around Times Square and the downtown area as the driver dropped off the passengers. We saw the Empire State Building, The New York Public Library, The Chrysler Building and the United Nations Building. At last we came to the Cruise Ship Terminal almost 2 hours after we had left JFK!! We were at the Cruise Ship terminal at 11am. We knew we were here earlier than most of the other folks who were coming from Connecticut. But NCL was already checking people in for the cruise, so we got in line. We turned in our Cruise documents and tickets and they took our pictures and gave us our key cards which would be our room keys and "credit cards" for any purchases on the Norwegian Dawn. The key cards were also used every time we got off and got on the ship to keep track of all the passengers. Now we had to wait to board the ship. The Dawn had arrived this morning at 8am from Bermuda and was still being cleaned and serviced for the return trip this afternoon. In fact, some passengers from the previous cruise were just now getting off! They started letting us onboard and we got on and waited a few more minutes in the main atrium area for our rooms to be ready. 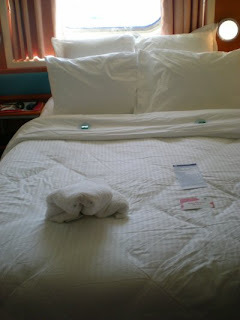 Our room was on deck 5 very near to the stairs and elevators which made it quite convenient for moving around the ship. We didn't have to go traipsing down long corridors every time we went back to the room. This made the mandatory lifeboat drill a breeze as well. 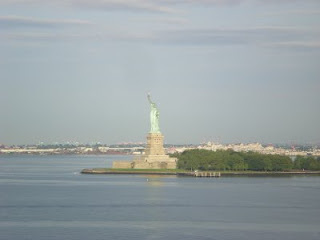 Once the ship was underway, we sat on the starboard side to see the Statue of Liberty and Ellis Island. 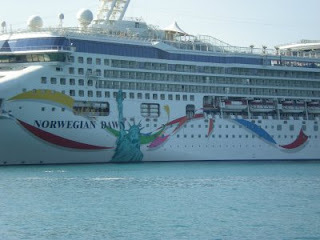 Another ship, The Norwegian Spirit was right behind us as we left the river and entered the ocean. All the letterboxers gathered in one of the Night Clubs onboard the ship for a Bon Voyage cocktail party the first night out from New York City. Immediately, there were clues distributed for boxes hidden onboard the ship and the CSI game began! Finding Letterboxes hidden all over the ship actually helped us to get to know our way around. The Norwegian Dawn is quite large with decks 4-14 open to the public and it was easy to get turned around, especially when some elevators did not go to all the floors. We spent two days at sea on the way to Bermuda. The weather was somewhat dreary and the seas were pretty rough for both days. 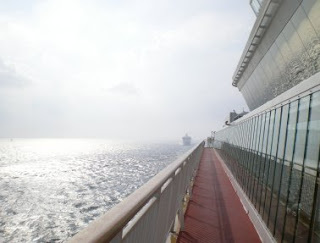 Our cabin on Deck 5 had a window and the waves would crash against the side of the hull and splash our window. It was fascinating to watch. Deck 7 had a promenade all the way around for walking. It was so rough and windy, the cruise ship personnel had blocked off the starboard side of the ship. 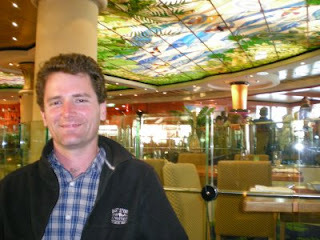 The Garden Cafe was the buffet area of the ship and where we would end up eating most of our meals. I was very disappointed that the soft serve ice cream machine was broken. It would not be fixed the entire cruise. But they did have hard ice cream and Ryan and I would enjoy a scoop of ice cream for dessert every night. The entrees were just so-so but the variety of fruit was terrific. I would often end up eating items from the kids section of the cafe. Macaroni and Cheese was one of my favorites from that station. There were a couple of sit down fancy restaurants that took reservations. The smart folks made their reservations the minute they got on the ship. If you did not have a reservation, the waits were often an hour or more. Ryan and I finally got a reservation at the Tex-Mex restaurant and had dinner there one of the nights we were in port at Bermuda. We also drank a lot of milk and iced tea. Sodas were an extra charge, but milk was free! There was another area called the Blue Lagoon that was run like a diner or hamburger stand. They served a very limited menu of Burgers and Fries, Fish and Chips and Chicken Fingers, but it was a quick and easy way to get lunch during the day. The tomato soup there was quite good. 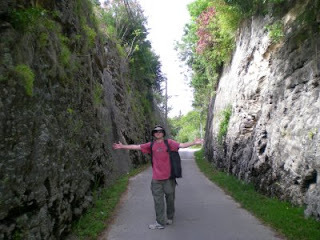 Ryan had decided that he wanted to Through-Hike Bermuda. The island is only about 22 miles long from end to end and there is a wonderful trail, The Railway Trail, that runs the length from Somerset to St. George. 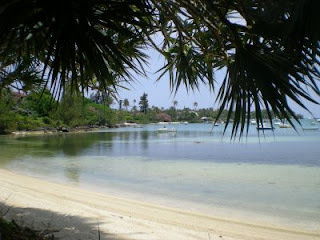 I would hike with him from the Royal Naval Dockyard where the Norwegian Dawn was docked to Church Bay, about 8 miles. The first 2 miles were not on the trail. We set out from the Dockyard walking with another of our letterboxing friends. We had to walk along the roads for the first two miles. This is quite daunting. The roads are narrow and curvy and the cars drive on the left, like in England. The cars, buses and motor scooters zip along at an alarming pace. It was still enjoyable. There are flowers everywhere. They grow wild along the road and fill every yard and garden along the way. The views of the coastline, rocky crags and clear blue water, were so beautiful. At Mangrove Bay in Somerset, we stopped at a little shop to pick up some water and postcards and we also stopped at the post office for some stamps. 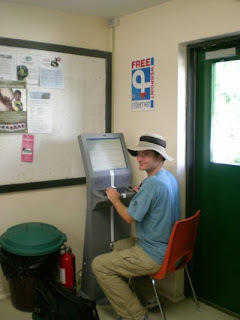 That is when we discovered that the post offices have a free internet kiosk. We would be back to make use of the kiosk another time! We reached the beginning of the Railway Trail and were able to finally get off the dangerous roads. Our next stop was at Fort Scaur. 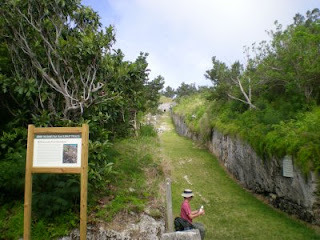 It is directly on the railway trail and is a National Park here in Bermuda. The Fort was built just after the Civil War. Britain had backed the Confederacy and was afraid of the North invading Bermuda in retaliation. We stopped, not for the history or the views, but for a letterbox. Onward on the trail to the Somerset Drawbridge. 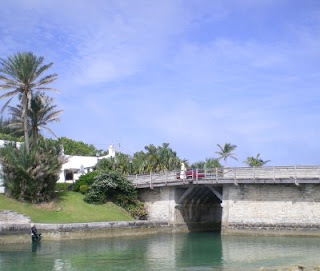 The Drawbridge is famous because it is the smallest drawbridge in the world. It only opens 18 inches for a sailboat mast. By the time we got to Church Bay, I was done hiking. We had done about 8 miles. 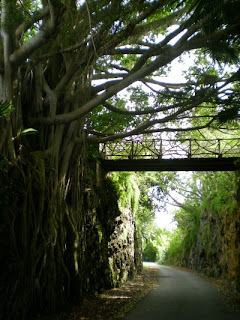 I would be taking the bus back to the Royal Naval Dockyard with my letterboxing friend, while Ryan continued on to the town of Hamilton and would take the ferry back to the Royal Naval Dockyard. The first thing we had done before we had started our hike was to buy a bus/ferry pass for the three days that we would be on the island. 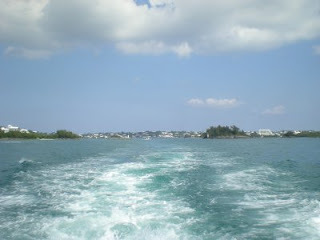 It is a great bargain and allows you to just jump on and off the buses and ferryboats to all points around Bermuda. Church Bay is supposed to be one of the best snorkeling beaches on the island along with Tobacco Bay. 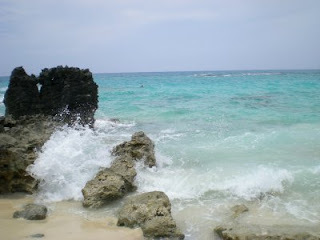 It was a nice beach, with the sand full of coral that gives the sand that pink tint that Bermuda is famous for! Unfortunately, the rough weather that we had encountered on the way to Bermuda was still causing the water to be very rough and the churning of the sand and such made the visibility almost nil. Ryan did some snorkeling, but I did not even bother. We had a lovely time laying around the beach at Church Bay and frolicking in the water. The next day we both took the ferry to Hamilton and Ryan continued on his hike to St. George. I would be touring around and then taking the bus to meet Ryan in St. George. Hamilton is the capital of Bermuda and it's biggest city. Fort Hamilton was my objective, it sits on a hill above the waterfront and has a wonderful moat around it that has been turned into a garden. After touring Hamilton, I took the bus across to St. George stopping for letterboxes along the way. I also stopped at the Railway Museum just north of the Bermuda Aquarium in Flatts Village. Next stop St. George. I also walked up the hill to see the Unfinished Church. The Church was meant to replace St. Peter's Church in St. George, but there was bickering between the parishioners between some who supported the new church and others who favored restoring the original church and the construction came to a halt in the 1890's. 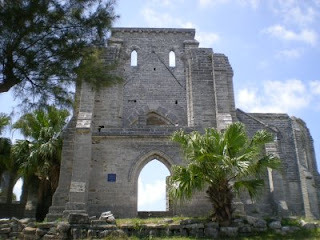 The Church was never finished and now is more of an attraction than if it had been completed. Ryan and I took the ferry back to the ship together. We could see where our room was located on the side of the ship. I had noticed that the paint outside our window was pink, so we deduced that our window was the one at the pink swoosh on the side of the ship! We also had finally gotten a reservation at the Tex-Mex restaurant on the ship. The Restaurant had a wonderful stained glass ceiling as seen in the picture. Our last day in Bermuda, Ryan and I had a couple of letterboxes that we needed to hide on the island and we went back into Somerset to hide them along the beginning of the Railway Trail. We also stopped at the post office to use the internet kiosk. Afterwards, I took the opportunity to for a last minute snorkel at the Snorkel Park at the Royal Naval Dockyard. Supposedly there was a charge to use the beach at the snorkel park, but the gentleman at the desk let me in for free. I think because he knew that the cruise ship was leaving in a few hours and I wouldn't be there for very long. I was hoping that the visiblity had improved in the last couple of days, but no luck. Still nothing to see under the water. We left Bermuda and made our way back to New York City. It is a much quicker trip back, only one day at sea. It was rough again once we were out into the ocean. Our last night onboard, the entire letterboxing group got together for a farewell dinner at one of the fancy restaurants. Ryan and I got our first and only towel animal at our cabin turndown service. We don't even know what animal it is....could be a toad? Back in New York, Ryan and I chose to walk off the ship with our luggage to speed our disembarkation. We needed to get to Laguardia Airport as soon as we could to increase our chances of getting back to Seattle. We got very lucky with a cab to the airport. We decided to take a taxi, especially since we had such a loooong ride on the Super Shuttle coming to the ship. I had been told that taxis to Laguardia would cost us about $45 or $50 dollars. It turned out that we had the fastest taxi driver in Manhattan. It was a nerve-racking trip, but we got to the airport in record time and it only cost us $35 including the tip! We made the first flight we tried to stand-by for out of town and got home to Seattle that night. Thank Goodness Ryan was wearing his lucky Wallace and Gromit tie.